Congratulations to Luca Veste and Paul Brazill for giving us another Off The Record collection. As in the case of last year’s all the proceeds from this compilation will go to two charities dealing with children’s literacy. Last year’s OTR collection dealt with popular songs, this year’s focus is on the cinema. In each case, the anthologies feature many different styles, but the predominant ones are new crime fiction. Most of the writings are by British writers, who give a UK feel to their world. Those of you who are Cockney impaired may want to brush up by watching The Crew, or some of the new British crime movies. I’ve watched too many licorice movies over the years. Ditto with reading British authors. Sometimes I want to call the swamps around my borough “The Moors”. David Jackson’s “The Time Machine” begins as an amusing tale of a young boy meeting a door-to-door salesman. After the salesman fails at his initial pitch, the boy wants to know what he is selling that’s special. The salesman has time for sale and the boy buys all he can afford. But he gets more time than needed. The ending had a very bittersweet feel. Richard Godwin’s “Once Upon A Time In The West” is one of the few stories to link to the movie of the same title. He examines the mind of Harmonica, the character played by Charles Bronson in the original film. This is a very fascinating idea as Harmonica had very few lines in the movie. I choose Patti Abbot’s “Mermaids” as a favorite because it takes place one county over from where I live. There is a famous park known as “Mermaid Lake” where many companies have their annual picnics. Abbot’s story concerns three young women who hitchhike their way up to the park after cutting school. The ending is very creepy and could be the start of a horror novel. It would take me more space than I can devote to praise all of these tales. 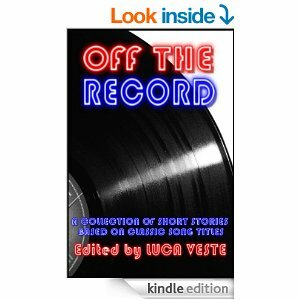 There are 47 short stories in this collection! Do purchase the book. And the money is for a good cause. Thanks for reading OTR2, Tim. Glad you enjoyed it. Would like to have reviewed more of the stories, but damn, there are soooo many.